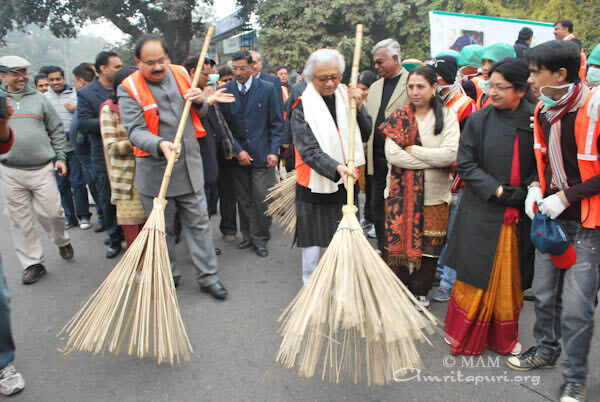 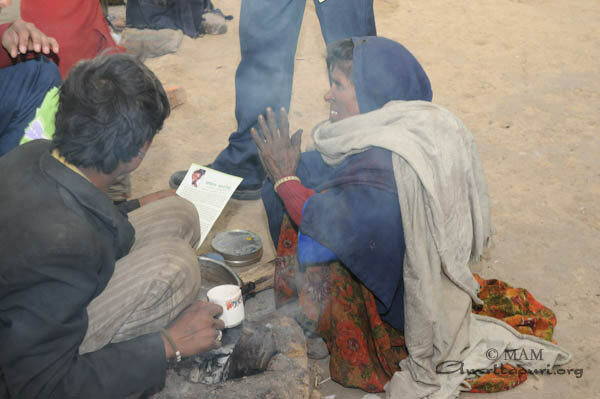 On the chilly cold morning of January 9, 2011, thousands of people were standing in unity holding brooms and shovels on the road which leads to the slums of Indira Market near Ramakrishnapuram in Delhi. 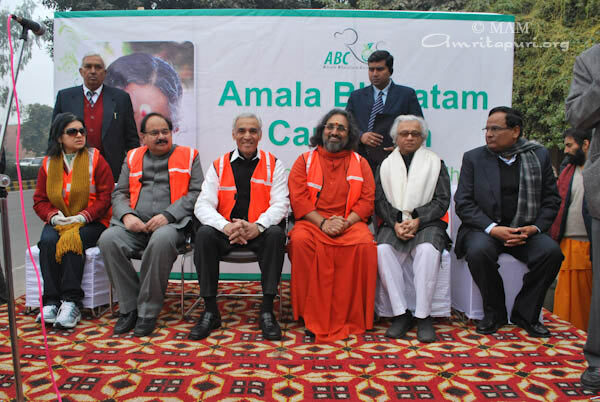 They were the people who were determined and confident to generate awareness about cleanliness and sanitation in India under the campaign ‘Amala Bharatam’. 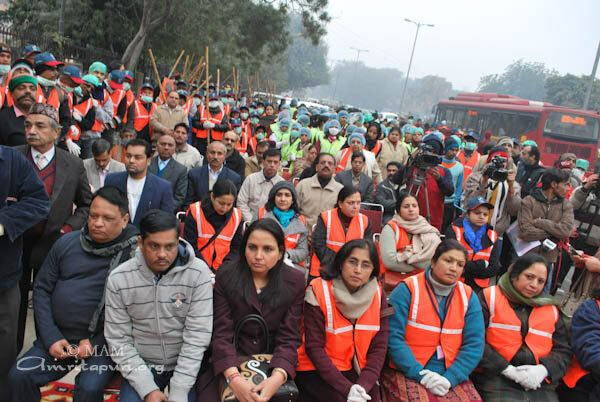 This included school children from various schools, members of organizations and devotees. 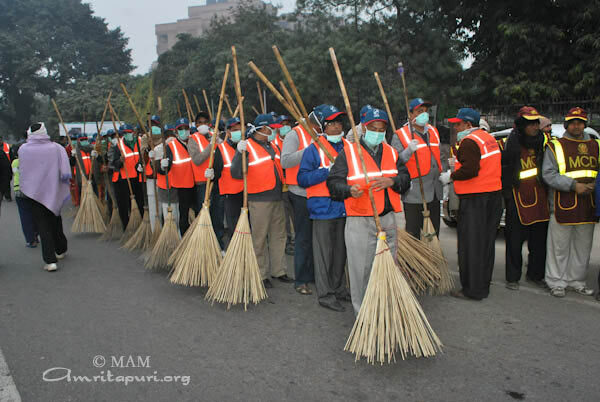 Once Swamiji made all volunteers take the Oath – hundreds of Children from various Schools and other volunteers took to the streets armed with cleaning tools. 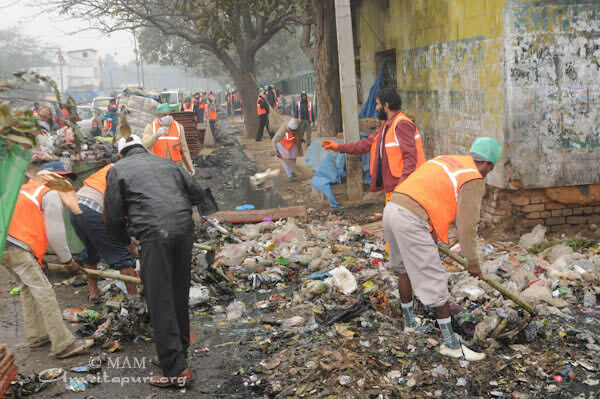 The one kilometre site for cleaning was carefully chosen by Amma’s devotees which had various vegetable vendors, slum dwellers and was littered with plastic, food waste, decomposed material and over flowing municipal collection points. 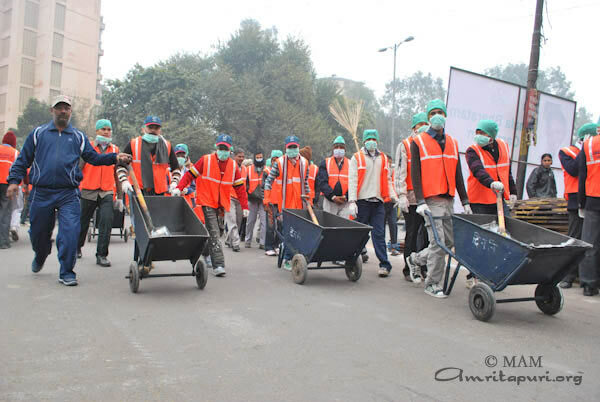 The enthusiasm was so high that the whole cleaning operation was completed in less than 3 hours and the slum dwellers were dumb struck that their whole area can be combed with such dedication in a matter of hours. 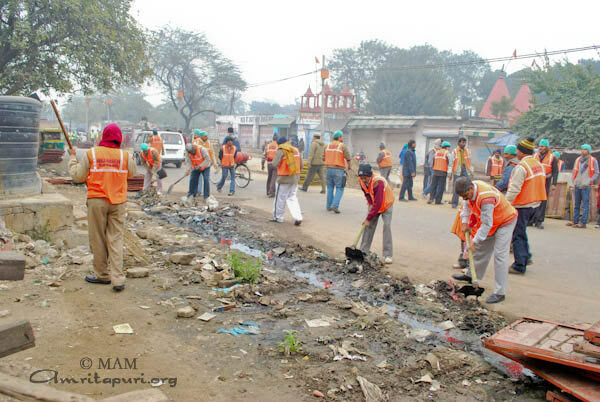 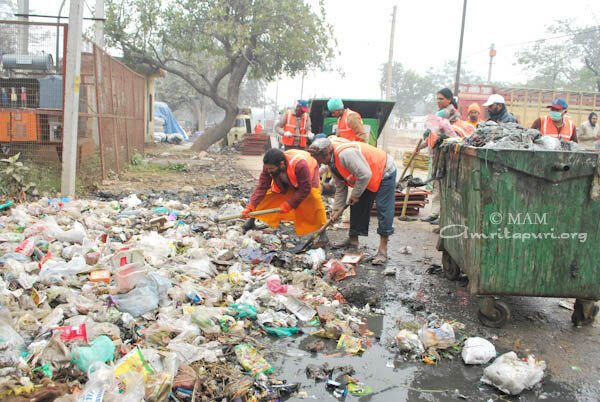 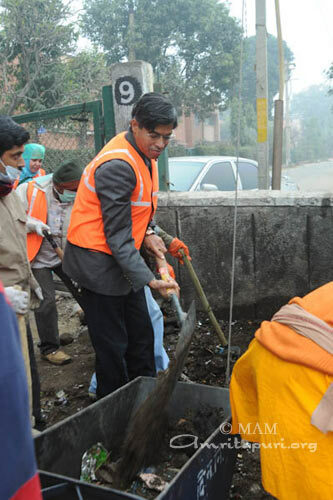 Swami Amritaswarupanandaji took the most difficult part of the operation to clean the municipal collection point with volunteers which was over flowing with decomposing waste combined with the stench of sewage. 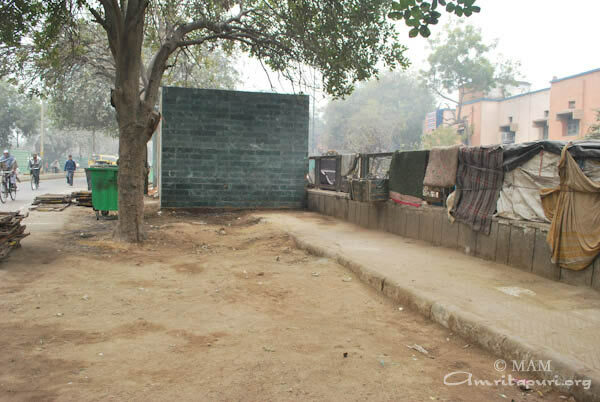 Even the locals could not believe their eyes that the ochre clothed could stand in the middle of this stench and carefully clean every inch of the disposal site with their hands ! 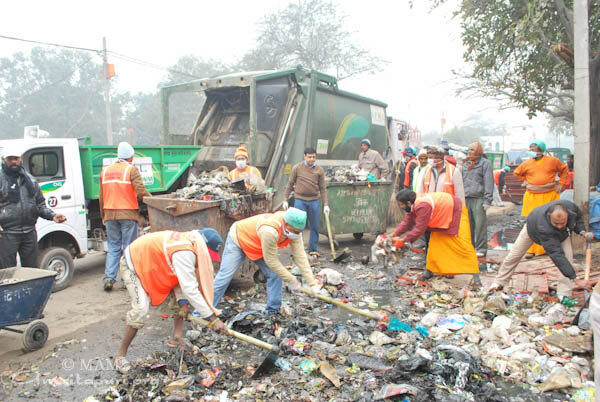 No one imagined that this disposal site would also be cleaned when we started the drive ! 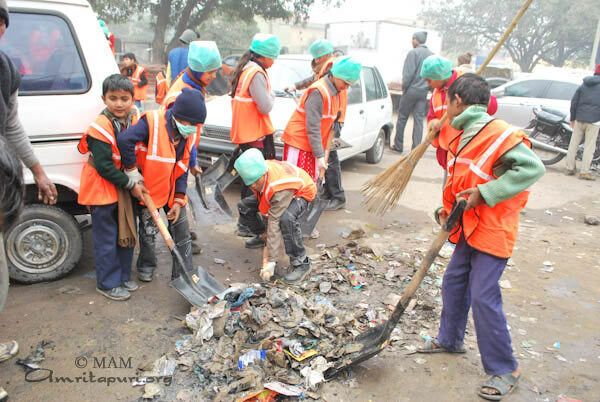 The message was clear – Swaccha Bharatam , Sundara Bharatam had sprouted in Delhi and was here to stay. 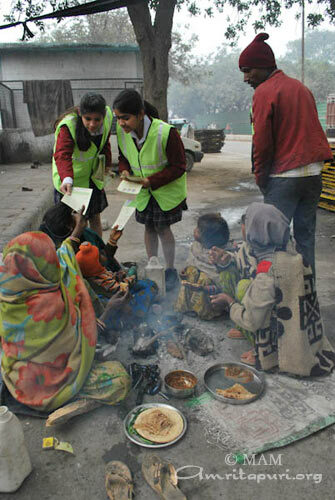 very nice…nice to see thiss.